WAFFLES: Uh oh. Boss at 10 o'clock. WAFFLES: I'm going to have to cut my mani pedi time short. WAFFLES: That's what all the cool metro-mancats call it, Boss. KATIE: What happened to just regular scratching? Location. Location. Location. 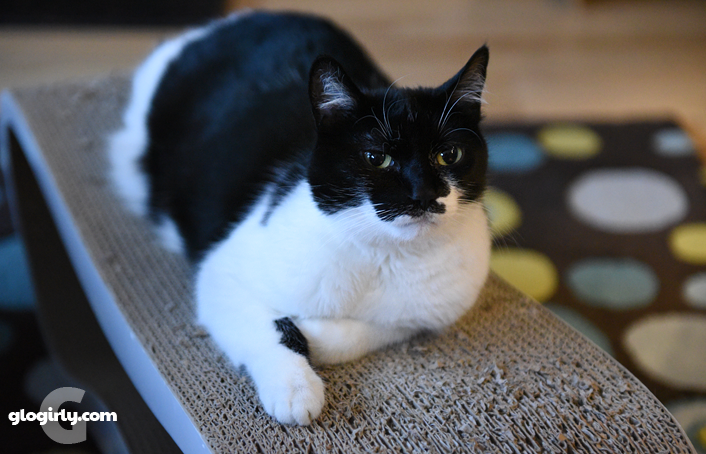 Just a few feet from the kitchen sits our most coveted scratcher. It gets a good workout at mealtimes, that is when Katie & Waffles aren't doing the Patty Cake Salsa. Though it's easily large enough for two... well, THAT's never going to happen! 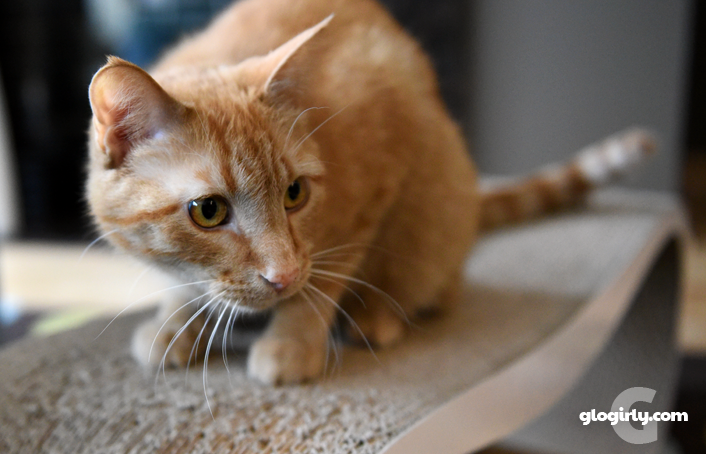 Today's photos were taken just a few months ago during one of Katie & Waffles spirited exchanges at the scratcher. We suppose it's their version of dishing gossip at the water cooler. it is a good thing that Waffles is keeping up with the current trends.. besides, I'm sure that regular ol scratching will be cool again in 2041, but be out again shortly there after..
Just don't get dem claws painted pink Waffles! Well we see what kitteh ended up with the coveted scratcher....Katie! You know, I am beginning to think those two actually LIKE each other! Kind of like Sparkle and Binga. Hmmmm? Wafles needs his number practice!! Allie from Tonks Tail can give fashion tips for the pink nails!! Waffles, men get their nails buffed. We didn't know that you were a metro-mancat, Waffles! 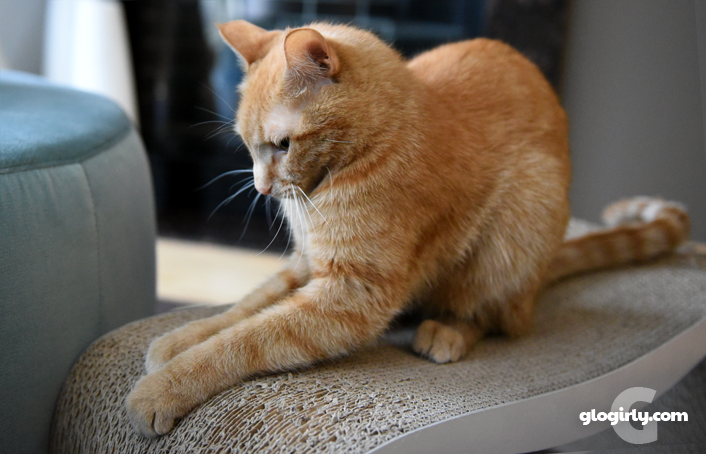 That looks like a pawesome scratcher. Isn't cardboard wonderful under the claws? We love such, um, "spirited exchanges." OUR spirited exchanges sometimes contain a HISS or two if there is an object of mutual desire involved (such as your scratching post). Hope you worked it out, W & K.
I thought you were going to show pictures of getting your claws trimmed!! Um... they don't have a water cooler? Come on! I thought Waffles and Katie had everything. We have a scratch fest here at dinner time as well! Z-Girl tried to move a scratcher out of the dining room area, so Manhattan took to using the top of one of the dining room chairs...and now the scratcher is back! Does Waff get to the one in the photo first, then Katie? Waffles..you are just so sophisticated..lol.. I've got two cardboard scratchers and they are very popular amongst the masses. Waffles, please do not tell us you are turning into a metro-sexual mancat. That is such a 2013 concept and you are more of a trend setter than a trend follower. Just give your man-claws a good old fashioned ripy, rip, rip on the scratcher & call it good. Just don't try sharpening your claws when Katie is occupying the scratcher. 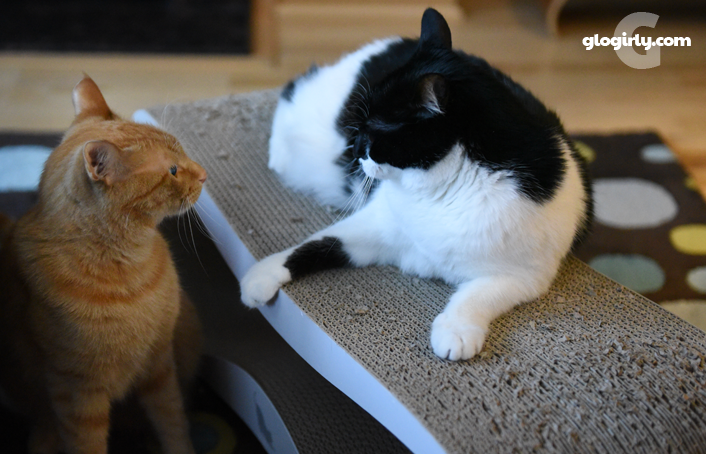 A mancat never wants to come between the Boss & her scratcher or you'll catch h, e double toothpicks! As long as you don't go all lumbersexual on us, Waffles! During your exchanges, do you guys just have a stare down or do you talk to each other? No, of course I’m not working for the Enquirer. Why do you ax? The favorite scratcher here just got mani/pedi-ed to death!